Chiropractic Care and Rehab offers quality care for patients with back pain in Estero, FL, Fort Myers, FL; Naples, FL; Bonita Springs, FL; and San Carlos Park, FL. Back pain is one of the most common reasons for missed work and limited activity. An estimated 58-80% of adults will suffer from low-back pain at some point in their lives. Back pain is not a diagnosis in and of itself; rather, it's a symptom of a medical condition. While medications can temporarily dull the pain, it's important to identify the source of your pain to find lasting relief. Mechanical: Most back pain is related to mechanical disorders that cause you to experience pain when your spine moves in certain ways. One of the most common forms of mechanical back pain is disc degeneration. The spinal discs act as cushions between the vertebrae, and as we age, this cushioning begins to wear down, causing increased pain with movement. A part of the disc itself can also start to bulge, or herniate, irritating the surrounding nerves. Mechanical back pain can also be caused by muscle spasms, strains, poor posture, prolonged sitting and standing, as well as repetitive motions or overuse injuries. Injuries: Twisting, improper lifting, and auto collisions can tear or sprain the ligaments surrounding the spine, leading to back pain. Traumatic accidents or falls can result in severe spinal injuries, fractures, or sprains of the spinal bones themselves. In rare cases, tumors caused by cancer or other serious conditions can result in back pain. Also less common are infections involving the vertebrae, like osteomyelitis. 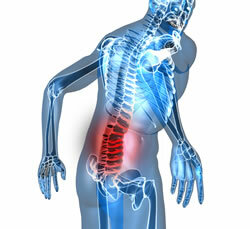 Our Estero chiropractors and massage therapists specialize in the diagnosis and treatment of back pain. They will work with you to identify the source of your back pain, and create a treatment plan tailored to your specific needs. Countless scientific studies have confirmed the efficacy of chiropractic care, massage therapy, and exercise for back pain. These non-invasive treatments can restore the mobility of your spine to improve overall function and reduce pain. Call Chiropractic Care and Rehab for effective back pain relief today at (239) 495-1166.